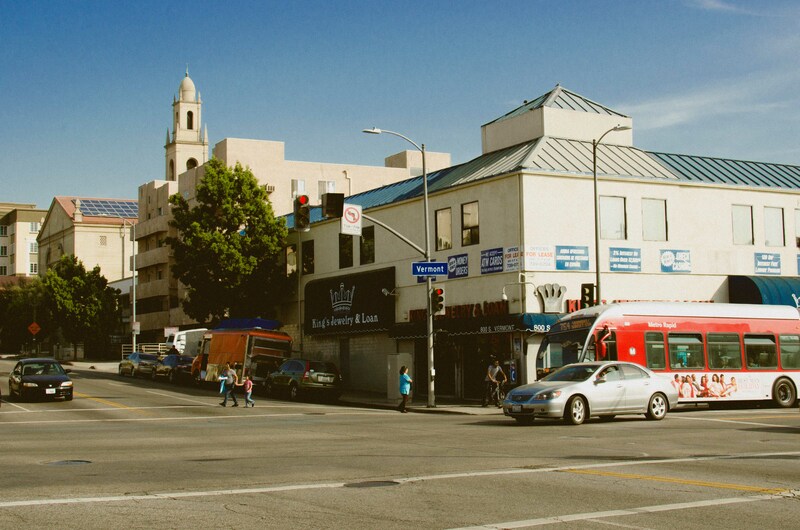 Our latest installment in our Then & Now series takes us to the intersection of 8th & Vermont in Los Angeles. The top photo was taken Sept. 2, 1950. I took the bottom photo last month, so roughly 63 years later. What’s changed? The Bank of America building is there still — sans the bank and now under a coating of stucco or stucco-like substance. The church is still there, too — now with solar panels. The old Los Angeles Transit Lines streetcar is, of course, gone to the mists of time. Matching the photos was a bit difficult as the Vermont bus no longer turns west onto 8th Street. But you get the idea. Again we find that a lot of Los Angeles’ past has survived into the 21st century. I think in some ways that’s a good thing — but it sure would be nice to see a lot less stucco and newer buildings a little more architecturally inspired than the apartment building in the bottom photo between the old bank building and the church. The power and communication lines are now burried underground or out-of-sight somewhere. Caught the 66 there today. Great picture. I had no idea a red car came through here, but got a hunch since there is a strangely oriented apartment near Western off of 8th. After looking close, I noticed it was just a lot fill for where tracks once were. I googled earthed the area, and you can still make out parts of the right away. Personally, I’m shocked since this is ten minutes from where I am, and imagining the red car instead of the 66 really is bittersweet. Absolute travesty what they did to that commercial building on the corner. Stuccoed it over – what a mess. That was not a Pacific Electric “Red Car”. 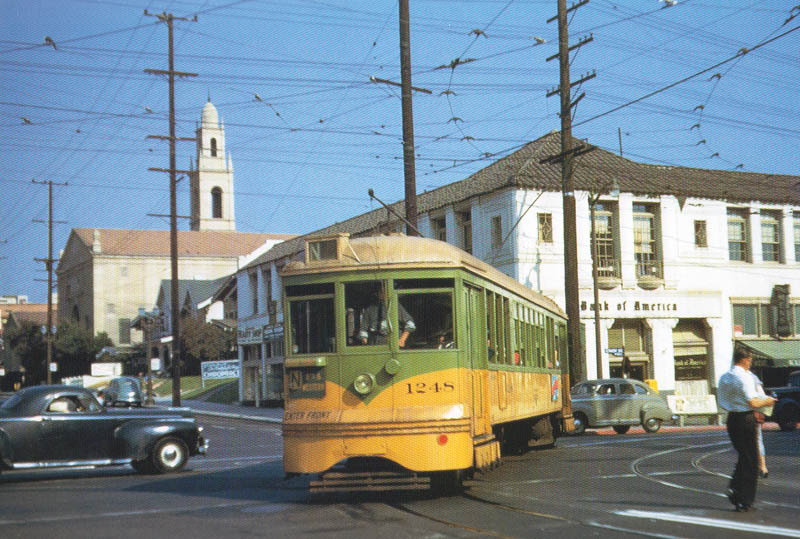 That was a Los Angeles Transit Lines “Yellow Car”.